With its heavy duty, solid wood table top and fashion-forward, rustic industrial base, there's so much to love about this counter height dining table. The small scale is handy in your kitchen breakfast nook or in a casual, open plan dining area. The dark, cast iron pedestal base is a unique touch that looks at home in casual, country cottage, transitional, or rustic industrial style rooms. 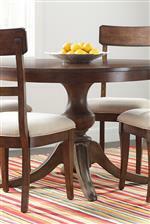 This style also available in 44" diameter or as a standard dining height table. The The Nook 54" Round Solid Wood Counter Height Table with Rustic Metal Base by Kincaid Furniture at AHFA in the area. Product availability may vary. Contact us for the most current availability on this product. 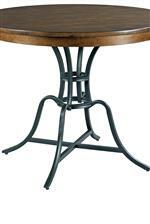 664-B04 Round Counter Height Table - Metal Base 1 36"
664-702 54" Round Dining Table Top 1 54" 54"
The Nook offers multiple seating and table options in two pleasing wood finish colors - Brushed Oak and Hewed Maple. Most tables are available in standard or counter height option, round or rectangular shape. Special features include cushioned dining chairs with stain-resistant performance fabric, industrial rustic metal table bases, and a kitchen island with drop leaves for easy storage and entertaining. And of course each and every piece is crafted to achieve a longer life with solid wood construction and expert joinery. Taking this collection the extra mile, table tops are finished with our protective Kinguard finish, keeping your solid wood table tops safe from scratching, scuffing, and everyday wear. 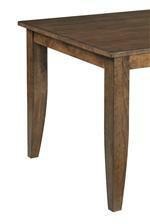 The The Nook collection is a great option if you are looking for Casual furniture in the area. Browse other items in the The Nook collection from AHFA in the area.